Mushrooms, corn and potatoes are some of the local specialties of Gangwon-do Province. Due to the province's geographical features, with many mountain and adjacent to the sea, it was difficult to find land for rice. For this reason, instead of rice, people in Gangwon developed various other recipes that use mushrooms, corn, potatoes or sweet potatoes to substitute the common Asian grain. The cuisine of Gangwon-do Province is characterized for its light and savory taste. Thanks to the delicious local ingredients, Gangwon-do dishes are quite popular among gourmets everywhere. “It’s because of the large amount of sunshine and the good soil,” said Director Yoon Sook-ja of the Institute of Traditional Korean Food regarding the deliciousness of Gangwon-do produce. “I once planted corn seeds, which are originally from Gangwon-do Province, in Seoul, but it had a different taste from the ones grown in Gangwon-do,” she said. “If you visit Gangwon-do, you should try the food made from local ingredients there,” Yoon added. Mushroom corn porridge allows you to enjoy the pure taste of mushrooms and corn. It offers the original simple taste of corn, combined with finely chopped, soft chewy mushroom slices. 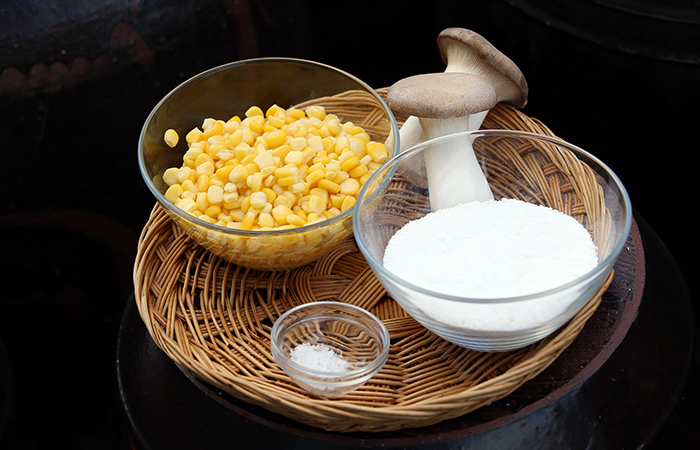 The main ingredients in mushroom corn porridge are king oyster mushrooms, glutinous rice powder and salt. Canned corn can also be used. 1. Wash the mushrooms and mince them finely into pieces. 2. Drain the canned corn and put it into a blender with 2 cups of water. Blend it all together. Fresh corn can also be used. 3. Put the water and glutinous rice powder into a pot. Stir slowly over medium heat for 5 minutes to make the porridge. 4. Add the blended corn into the pot. Stir slowly over medium heat for 10 minutes. 5. Boil it all and stir the porridge until it thickens. 6. Add the minced mushroom and salt to taste. 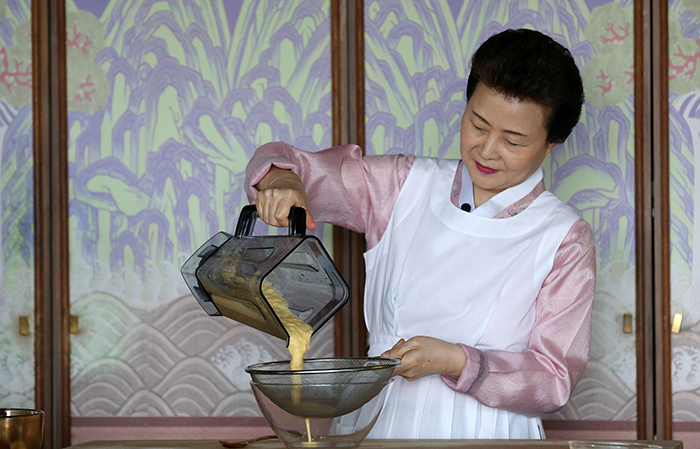 Director Yoon Sook-ja of the Institute of Traditional Korean Food drains blended corn for the corn and mushroom soup.